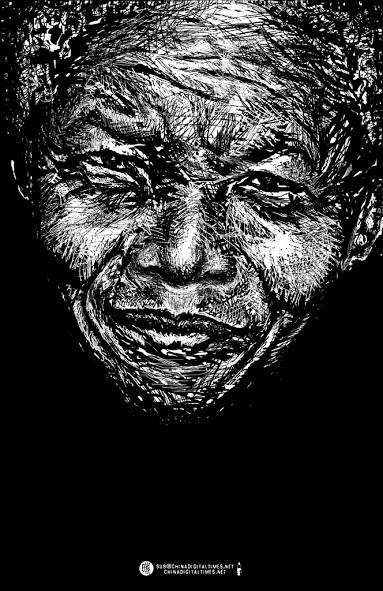 CDT contributing cartoonist Badiucao recently posted this portrait of Mandela. After the passing of former South African President Nelson Mandela, he was honored by Chinese dissidents and China’s official media alike. While state media drew parallels between the late revolutionary and Mao Zedong and praised South Africa’s establishment of relations with the PRC during Mandela’s presidency, dissidents commended Mandela’s activism and saw a more apt parallel between the Nobel laureate/former political prisoner and Liu Xiaobo. A spokesperson representing the Dalai Lama said the Tibetan spiritual leader will not be attending Mandela’s December 15 memorial service in South Africa. The Dalai Lama was denied a South African entry visa in 2009 and again in 2011. China’s Vice President Li Yuanchao will be attending Mandela’s memorial. After Ukrainian President Yanukovich met with Russian President Putin last week to lay plans for a “strategic partnership,” protestors in Kiev tore down a statue of Vladimir Lenin on Sunday.